Abstract: Differences do exist which separate the high-end from the more value oriented products, but the visual results are less dramatically affected. Since SGI and Apple first brought LCD displays into the perspective of mainstream consumers a remarkable occurrence has been precipitating. Objects which were once considered the playthings of people with too much money to spend have dropped down to more reasonable pricing, and users have embraced them fully. Flat screen displays are now bundled with off the shelf PC's by HP, IBM, and Dell as if they had always been. Consumers are looking through the mass of LCD's which have been introduced in the last two years, searching out for the best deals, and the best features, and while larger companies like Viewsonic, Samsung, NEC, Hitachi and LG may control the marketplace there are a good many smaller manufacturers also worth consideration. Given the high costs of actually making the LCD glass panels, there are relatively few companies with the resources to compete in this arena, but for those who do, the semiconductor-like properties inherent in the technology mean that there is a good baseline from which quality only jumps upward. Unlike CRT's which could have super-fuzy corners, or misground glass there are fewer ways for an LCD panel to fail, and consequently the end results of even the most unknown OEM are generally acceptable. Differences do exist which separate the high-end from the more value oriented products, but the visual results are less dramatically affected. I suppose one analogy would be space rockets - it could be argued that the US makes the most technically advanced, and highest quality rockets for delivering satellites - but Russia, China, Japan, and India all have programs which are equally capable to achieving the same complex tasks. 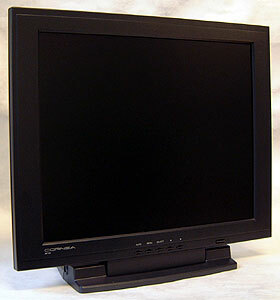 In any event, that is long preamble to the introduction of Cornea Systems and their MP704 17" LCD monitor. The LCD panel features a brightness of 250cd/m2 and contrast ratio of 400:1. In stark contrast to the industry trend, Cornea disclose their pixel response time at 25ms. This number is often difficult to find, and has a large bearing on how a display looks in fast FPS games or action-oriented DVD's. The more important display specs are listed below for your consultation. One of the benefits with smaller manufacturers is that the end results are less fancy, and more understated. While the Viewable angles for the LCD panel are lower then we would have liked, the simple control panel, and simple black frame make up for it in on regard. There is little to distract the eyes when working away, and that is a good aspect often overlooked in the rush to market. Be that as it may, this is a no frills LCD monitor with a single analog VGA connector and power socket. There is no internal audio, not DVI connector to support digital video signals, the stand is not detachable and the display is not armature mountable. What you get is what you see, a desktop LCD display for around $500USD.